The amount of sea ice left on Hudson Bay this year is comparable overall to the “good old days” (before every early breakup year was blamed on man-made global warming) but the distribution is very different. 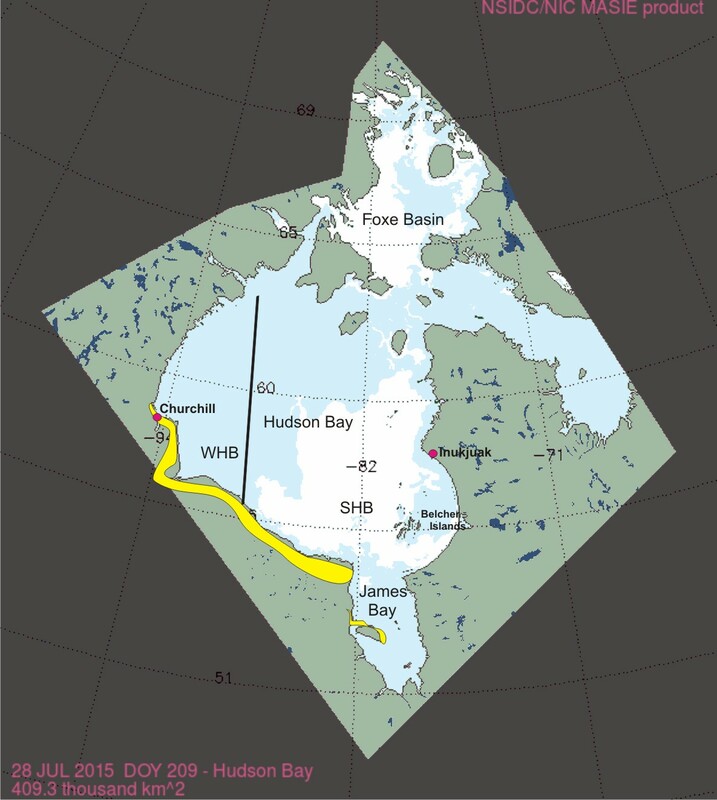 The ice is primarily in Southern Hudson Bay (SHB) polar bear territory, as shown in the NSIDC sea ice map below for 28 July, where places that bears come ashore are marked in yellow (Obbard and Middel 2012) – the ice was thick enough last week to require an icebreaker to reach the community of Inukjuak. At 20 July, 5 out of 9 collared SHB females were still on the ice near the Belcher Islands. I think it’s still too early to say for sure whether polar bears have drawn benefit from the longer ice coverage or if the conditions indicate that the ice was too thick for optimal hunting during the critical spring feeding period from April-June. I’d say the odds could be about even. Photos of WHB bears ashore so far look to be in good shape (e.g. 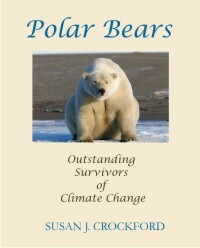 here and here), so the hope is that these bears are representative of the populations at large. We know from past research that thicker-than-usual ice conditions can and do occur on Hudson Bay – thick spring ice was reported to be the cause of a decline in WHB ringed seal numbers and polar bear survival in 1991 (Crockford 2015). 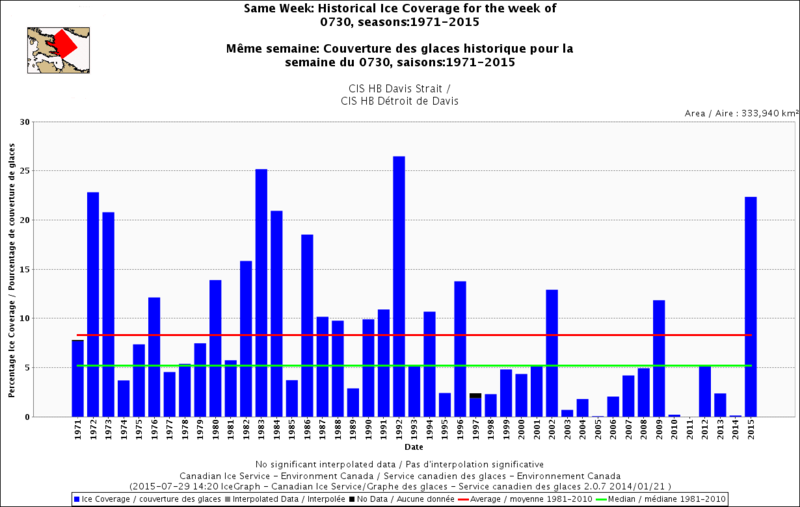 But the odd distribution of ice melt this year suggests that thick ice conditions were perhaps confined to the eastern portion of the bay in 2015. Early clearance of ice in the NW portion of the bay means that the official breakup date for WHB for 2015 (the one that polar bear biologists use to correlate with survival and body condition) probably will be quite early. 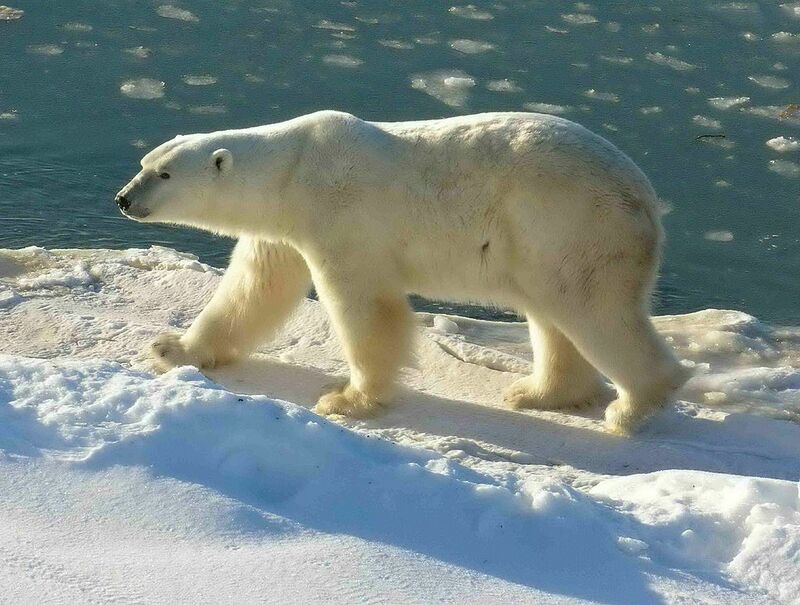 Because of the way the ice was distributed in 2009, WHB polar bears with collars came ashore at about the same times as they did in 1992, when the official breakup date was much later. Note that the region of NW Hudson Bay defined by the Canadian Ice Service in the above graph is not the same as the WHB polar bear subpopulation region: it has quite different boundaries. And also note that overall ice coverage in 1990 at 30 July (first of the graphs above, for WHB) was not particularly low – it wasn’t as high as it is this year (>20%), but it was still > 10% (cf. 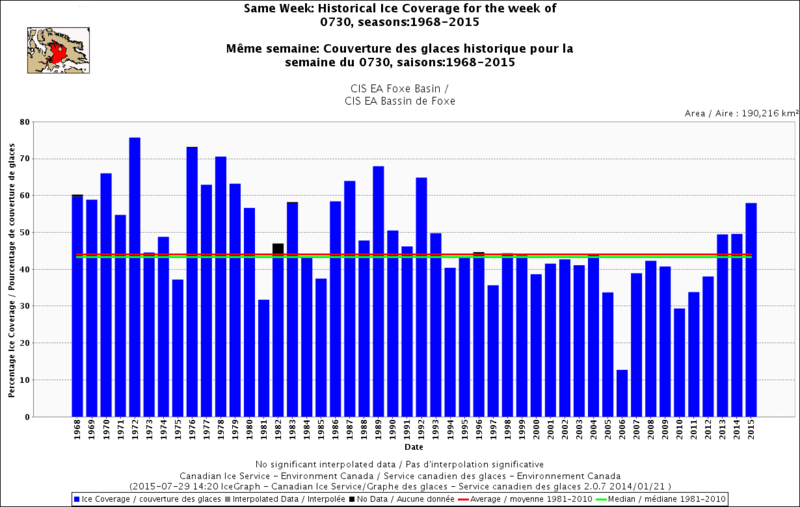 1991 had almost no ice remaining at 30 July). 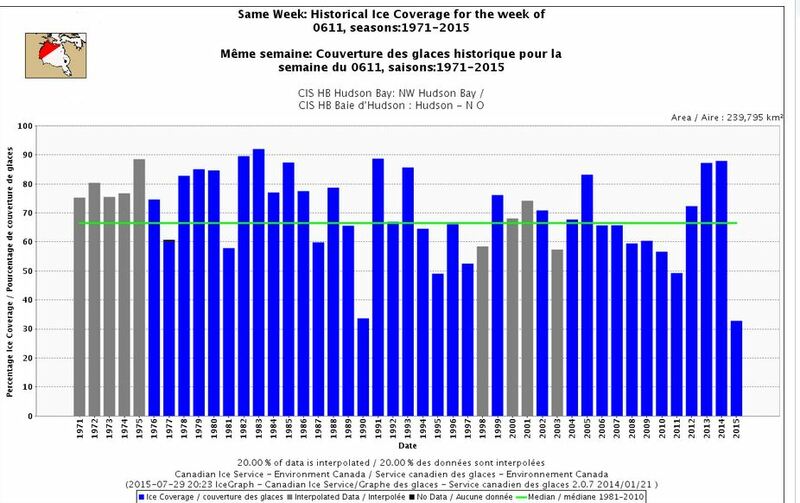 So despite the early ice clearance of NW Hudson Bay in 1990, overall ice coverage was not particularly low later in the season. 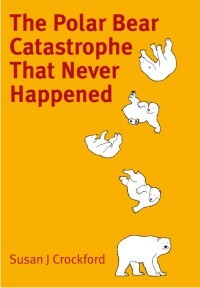 And as I’ve pointed out before, none of the papers that correlate WHB breakup dates to polar bear condition and/or survival mention 1990 as the worst year ever, in spite of its very early official breakup date. 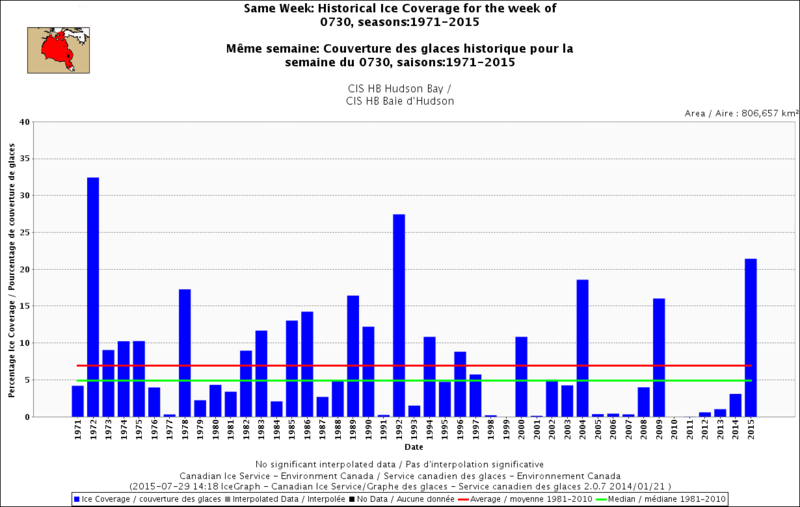 So, here is the conundrum: breakup of NW Hudson Bay was as early this year as it was in 1990 (earliest WHB breakup year on record) but ice coverage over the entire bay for the week of 30 July was the highest since 1992 (latest WHB breakup year on record). 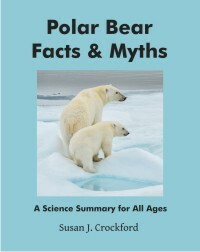 What that means for WHB and SHB polar bears remains to be seen. This entry was posted in Sea ice habitat and tagged breakup, early breakup dates, Foxe Basin, Hudson Bay, icebreaker, NW Hudson Bay, Obbard, polar bear, science, sea ice, Southern Hudson Bay, thick ice, western hudson bay. Bookmark the permalink.